Thatch is the intermingled layer of roots, stems and other natural material that builds up at the soil surface. Some thatch (1/2 inch or less) is desirable as it will act as a cushion and help protect the lawn from temperature extremes. When thatch exceeds 1/2 inch, it will reduce lawn vigor and increase insect and disease problems. Core aeration offers many benefits for your lawn, and has proven to be one of the most essential processes in maintaining a healthy, thick lawn. 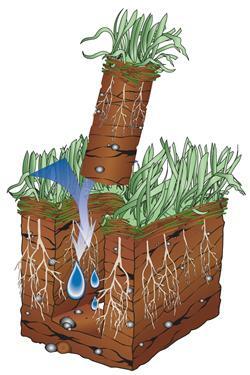 The process opens up the lawn by removing small plugs of soil and thatch, allowing more air, water and nutrients to reach the root zone, leading to better plant growth. The microorganisms in the plugs that remain on the surface will dissolve back into the thatch layer to help it breakdown, naturally. 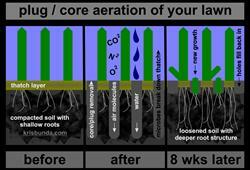 This process also reduces reduce soil compaction. Core aeration is best done during the early Spring for warm season grasses and more frequently than annually for turf areas that receive large amounts of foot traffic. Premier Tree and Shrub Care recommends over-seeding Fescue lawns each Fall to help keep them thick and lush. 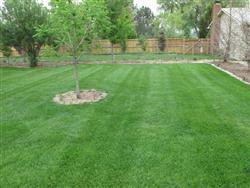 Unlike warm season grass, Fescue lawns do not spread. Seeding it annually will help ensure that your grass meets its potential. Each time Summer hits it, some of it will die back, which makes fall over-seeding that much more important. All over-seeding is typically done in between mid September and early October. Fescue's growing season begins in the fall. Seeding in the spring is discouraged because the new grass won’t have enough time to develop a good root system before the heat of the summer, and you will lose a lot of it. Also, if you seed in the spring, you will be unable to apply pre-emergents to those areas and may have a weed problem. Re-seeding again in the Spring is sometimes needed for newly established turf areas and areas with erosion problems. We will select the best type of seed for your lawn areas, mechanically core aerate the zone, and over-seed those areas. The mechanical aeration helps incorporate the seed into the soil and reduce soil compaction.